If there are no rear seats, the child shall be secured as described above in the front seat except that no child shall be secured in a rear-facing seat in the front seat of any vehicle that is equipped with an active passenger-side airbag. The aforementioned is acceptable if the airbag is deactivated. Q – My son is 7 years old and is 58 inches tall. Is he required to ride in a booster seat? A – No. Although he is only 7 years old, he is over 57 inches tall and requires only a properly fitted seat belt. Q – My daughter is 8 years old but only weighs 76 pounds. Does she need a booster seat? A – No. Once a child is 8 years of age, s/he no longer needs to ride in a booster seat, but s/he must be secured in a properly adjusted seat belt. 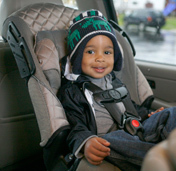 Q – How can I determine if my child will be properly protected by the vehicle’s seat belt? A – Use the seat belt fit test on all children under 13 years of age to be sure they are big enough to safely use the adult seat belt without a booster seat. naturally at the seat edge. If they do, continue the test. If they do not – the child should continue to ride in a booster seat. Buckle the lap and shoulder belt. Be sure the lap belt lies across the upper legs (the pant’s pocket area). If it lays across the upper thighs, move on to the next step. If it does not, the child should continue to ride in a booster seat. Be sure the shoulder belt lies on the shoulder or collarbone (and is not cutting into the neck). If it lies on the shoulder, move to the next step. If it is on the face or neck, the child should continue to ride in a booster seat. DO NOT place the shoulder belt under the arm or behind the child’s back! Be sure that your child can maintain the correct seating position for as long as you are in the car. If your child begins to slouch or shift position so the safety belt contacts the face, neck, or abdomen, the child should continue to ride a booster seat until all the steps can be met.